However it says online its Tin Plated Steel? Is that harmful? My birds are on the other end of the house with the doors closed and kitchen window open. Do you have a picture of the label? Does it say anything about being non-stick? 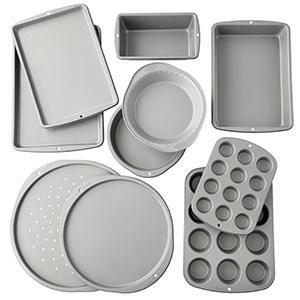 "Be it breakfast muffins, carrot cake, cookies or homemade pizza, our durable steel pans have a non-stick coating that ensures quick release and they’re dishwasher safe for easy cleanup"
Here is a picture of some of their non-stick products. Contact Wilton directly and ask if your cupcake tin contains PTFE (Polytetrafluoroethyline), PFOA (Perfluorooctanoic acid) or Teflon (a popular brand-name for PTFE/PFOA products). You will need to give them the abbreviations and spell the full names of each. Just asking about Teflon is not enough, because not all PTFE/PFOA is Teflon, but Teflon is a popular variety. It is my understanding that silicone cooking stuff is also unsafe, so you will need to find out what coating makes it "non-stick"...PFOA/PTFE/Teflon can be mixed into metals during the molding process, it can be applied as a colored coating, or it can be completely transparent. PTFE/PFOA/Teflon-free products almost always have a statement about being "natural" or 100% stainless etc, and many will clearly state PTFE/PFOA/Teflon free. They also usually don't talk about being non-stick as much. Non-stick is usually a red-flag. I don't think I would take the risk, as birds have died on separate floors from Teflon use. Wait until you can verify. Whenever you get pans etc, it isn't just the metals that you need to worry about. Last edited by noodles123; 02-10-2019 at 09:27 AM. Even if she uses paper liners, that won't prevent PFOA/PTFE from off-gassing...If the metal heats up, so does the coating. Dry heat is actually even more dangerous. 100% correct! I was just focusing on the statement saying they were tin plated! After looking at the product line, I would almost guarantee that they are plastic coated! Still be great for freezing chop! Even on their site, Every pan is nonstick coated! Last edited by Flboy; 02-10-2019 at 10:21 AM. I'm not trying to change anybody's minds here but "Generally speaking, Teflon is a safe and stable compound. However, at temperatures above 570°F (300°C), Teflon coatings on nonstick cookware start to break down, releasing toxic chemicals into the air"
Just having and cooking with Teflon is not going to kill your birds, falling asleep and having a pan overheat above 300°C might depending on your dwelling layout. BUT, it has killed birds at lower temperatures with normal use (see egg-frying post, among others). It isn't consistent enough for me to trust it at all. Arrows are going to be flying all direction on this one, I already see one has? As a engineer I learn one very important thing. Murphy's Law. A rule that states, “If something can go wrong, it will.” An addition to this law reads, “and usually at the worst time.” Hence why we test critical components to breaking point and real world testing as well now. Yes I seen Teflon coating break down over time well below that 570°F (300°C). Then you have to factor in hot spots that will develop over time, or the family member, or friend that one day by mistake, or don't know any better cooks on high heat, or leave heat on? It only take a couple of second of exposure to kill your bird pretty much almost instantly and nothing you can do to stop it. Then you have electric heating appliances where coil will develop hot spot in time and open up. Sure it work for a year fine no problems then one day as heating element, or coil ages hot spot develop and burn off the coating and now dead bird? Yes this has happen, I even seen one heating lamp that they didn't realize had Teflon work fine before and one day killed the entire flock of birds in that enclosure at a zoo. PFTE/PFOA is a big NO period on anything involving heat, it not worth the risk. Last edited by ParrotGenie; 02-11-2019 at 04:40 PM. So I said I wasn't going to try to change anyone's mind and I wont enter into that discussion. Take it for what it is. "DuPont claims that its coating remains intact indefinitely at 500°F . Experiences of consumers whose birds have died from fumes generated at lower temperatures show that this is not the case. In one case researchers at the University of Missouri documented the death of about 1,000 broiler chicks exposed to offgas products from coated heat lamps at 396°F ." "Teflon-lined Amana oven was used to bake biscuits at 325°F; all the owner’s baby parrots died  ." This is just one source...many verified instances of deaths occuring with responsible use (well within the "safe" range).